Left Over Turkey – What to do with it! Two week ago we celebrated Thanksgiving with our Bible study and we were in charge of the turkey. I cooked a 27lb bird for 16 adults and 18 kids… we ended up with LOTS of leftovers! I’m not complaining! We had some for dinner that week and I froze some for future use! BUT… then we had Thanksgiving with my in-laws and we had even more leftovers. I didn’t make the turkey, but my mother-in-law said there was no way they were going to eat it and no one else wanted to take any home. I ended up with about another 10 lbs of cooked turkey! It’s coming out my ears! So in case there are others like me who have LOTS and are trying to find creative ways to have it… here are a few of the recipes I’ve come up with! 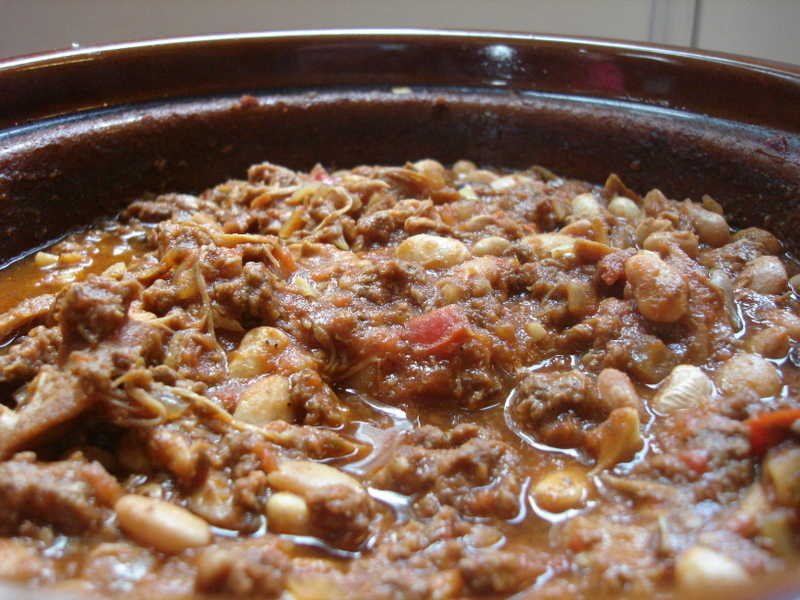 Chili – I’m planning to make this later this week as we are expecting some more winter weather! This is a great way to heat the house, have a GREAT comforting smell all afternoon and a delicious dinner waiting with lots of leftovers that freeze well! I plan to use my traditional recipe, but sub out some of the meat with a pound (or more) of turkey. I also plan on using turkey stock instead of water as well. I have that coming out my ears as well since I had three carcases! So far I have 2 gallons of stock and more still to make! Turkey strips dipped in honey mustard – I’m always looking for easy lunches. Today we had strips of warmed turkey dipped in honey mustard for lunch with a small salad and grapes. It was really good and the kids LOVED the finger food with a sweet sauce.. .who wouldn’t!? When I make my honey mustard I take about 2 TBSP of honey and about 4 TBSP of mustard and mix them together and taste and adjust accordingly. If you use store bought mustard then you will need a higher mustard ratio. If you use my homemade recipe linked above, then it won’t take as much since it’s STRONG and SPICY! Warm Spinach Salad – This recipe I usually use jowel, bacon, or sausage, but since we love the flavors of the salad and had lots of turkey I decided to try and see if it could be changed! It can! However, I will say it needs A LOT more mustard and balsalmic vinegar than it calls for… like 4 times more! Just slowly add more and taste as you cook so that it doesn’t get too strong. We like a stronger flavor, but the turkey soaks it up that it really took a lot. But it works and we all really enjoyed it! Leftover are just as good warmed up! Shredded with some BBQ sauce – That kinda goes without saying… pretty simple to do and doesn’t take much instruction! This would be a simple lunch or dinner! A friend of mine shared her BBQ sauce recipe with me that she uses and it’s now our go to as well. Neely’s BBQ sauce is to DIE for! It’s fantastic and when I make it, we look for things to put it on! Try it and enjoy! Taco Salad – Another simple meal. Not really all that seasonal, but is a great way to use the turkey! I think the salad calls for ground beef, but I plan on chopping the turkey and warming it in the cast iron skillet with some turkey stock and taco seasoning. Once it warms and the stock reduces it’s done and read to serve! So there you have it… a few menu ideas for using up all that cooked turkey! Let me know what you are planning to do with it! I’m sure we will still have some left even after making all these recipes! So please share!